With the ever - increasing demand for power and the limited availability of conventional resources, man has turned to renewable energy sources. These renewable sources include wind, solar, tidal, geothermal and the like. Their contribution to the global power demand has been increasing steadily with the advancement in technology. Heat has been radiating from the Earth's core for billions of years. This heat is originated since the formation of the Earth and it is continuously regenerated by the decay of radioactive elements. The rate of this regeneration of geothermal heat is so high that it makes the geothermal energy a renewable resource. Near the Earth's core, the temperature ranges about 5500 degree Celsius. This heat is basically the thermal energy stored inside the Earth's core and the Earth's crust acts like an insulator and keeps the heat trapped inside. This thermal energy is known as geothermal energy. (geo=earth and thermal=heat). This energy is estimated to be one or two orders larger than all the energy recoverable from nuclear sources. Direct heat conduction does not produce much heat on the surface. Also, magma buoys up to the surface only at selected locations like active volcanoes. Whereas magma is injected into deep rifts and causes heating of the underground water. This geothermal energy rises upwards due to one of the above reasons and causes large amounts of underground water to be heated on or below the surface of the Earth. Such locations are called Geothermal reservoirs. Such reservoirs are either on the surface in the form of hot springs or underground reservoirs which are reached by drilling wells. 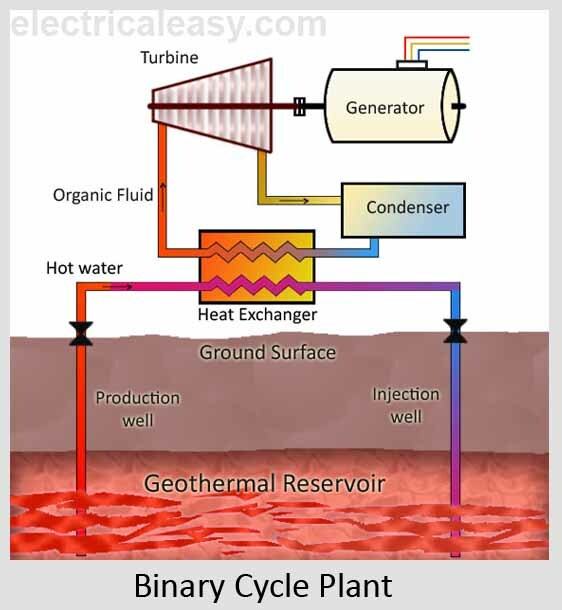 The heat energy in geothermal reservoirs can be carried up to the surface and utilized to produce electricity by geothermal power plants. A geothermal power plant uses steam obtained from these geothermal reservoirs to generate electricity. Wells are drilled at the appropriate locations to bring this geothermal energy up to the surface. A mixture of steam and water is collected from the production well. Steam separators are employed to separate the steam and use it to operate turbines. The further process is quite similar to a thermal power plant - steam turbines run the generators and, hence, electricity is generated. The condensed steam and the water collected from the production well are injected back into the reservoir through the injection well. This is, however, a general working principle of a geothermal power plant. The particular working of the plant depends upon the type of the plant. This is the simplest and oldest type of geothermal plant. It directly uses steam from the reservoir to operate the turbine. The steam is collected from the production well and used to operate low-pressure turbines. Hence, the working fluid is steam. The used steam is then condensed and injected back through the injection well. 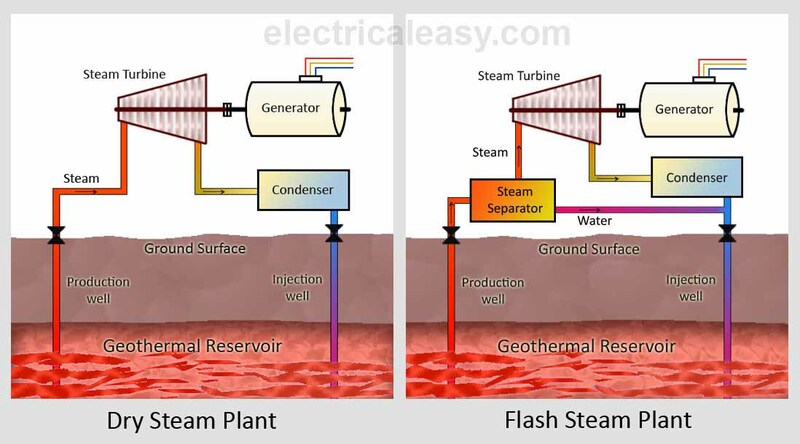 Flash steam power plants are the most commonly employed geothermal plants today. They operate on the geothermal reservoires having water temperature greater than 180 degree celcius. The high pressure hot water from the reservoir flows up through the production well due to its own pressure. The pressure decreases as the water flows upwards and, hence, some of it gets converted into steam. The steam is seperated from the water by steam seperator and sent to drive the steam turbine. The unused water as well as the condensed steam are injected back through the injection well. Binary power plants are the recent development. They have made it possible to produce electricity from geothermal reservoirs with temperatures lower than 150 degree celcius. In these plants, hot water from geothermal reservoir is used to heat up an another organic fluid having a lower boiling point. Thus, here, the working fluid is the secondary organic fluid and not the water from reservoir. The heat energy from the water is transferred to the working fluid in the heat exchanger. As a result, the working fluid vaporizes, and then drives the turbines. The spent fluid passes through the condenser and the cycle repeats. The water is injected back into the reservoir through the injection well.